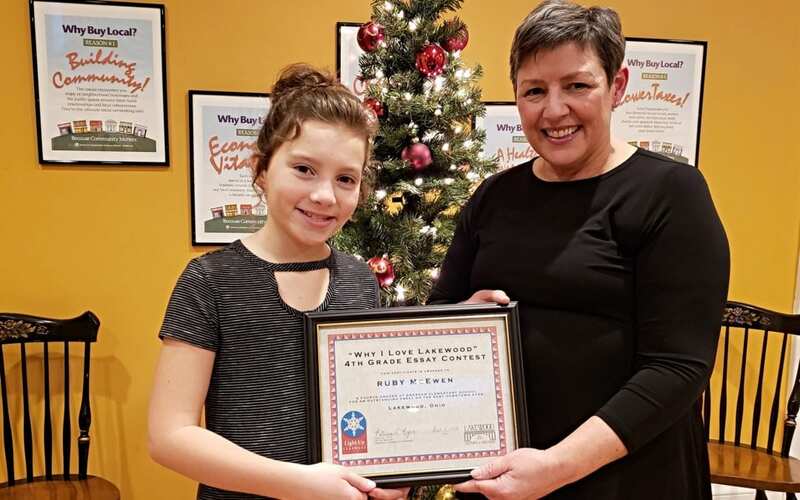 Ruby will be awarded a cash prize of $100 and will ride in the Light Up Lakewood parade before she takes the stage with Lakewood Mayor Mike Summers and Santa Claus to “flip the switch” on December 1st to turn on the lights in Downtown Lakewood during the Light Up Lakewood festivities. 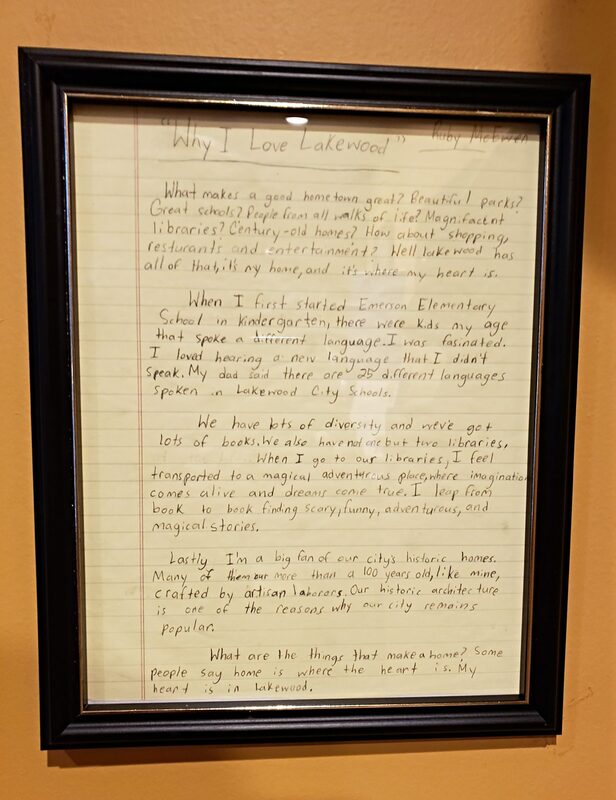 Ruby’s winning essay adorns the wall at the Lakewood Chamber of Commerce. What makes a good hometown great? Beautiful parks? Great schools? People from all walks of life? Magnificent libraries? Century-old homes? How about shopping, restaurants and entertainment? Well, Lakewood has all of that, it’s my home town, and it’s where my heart is. When I first started Emerson Elementary School in kindergarten, there were kids my age that spoke a different language. I was fascinated. I loved hearing a new language that I didn’t speak. My dad said there are 25 different languages spoken in Lakewood City Schools. We have lots of diversity and we’ve got lots of books. We also have not one, but two libraries. When I go to our libraries, I feel transported to a magical, adventurous place, imagination comes alive and dreams come true. I leap from book to book finding scary, funny, adventurous, and magical stories. Lastly, I’m a big fan of our city’s historic homes. Many of them are more than a 100 years old, like mine, crafted by artisan laborers. Our historic architecture is one of the reasons why our city remains popular. What are the things that make a home? Some people say home is where the heart is. My heart is in Lakewood.